As New York fashion week fast approaches (September 9th-16th 2010) and Nicole Richie is likely to attend some shows as she will be in town for Fashion's night out. I have compiled a few of my favourite pictures of Nicole Richie sitting front row at past NYFW shows. 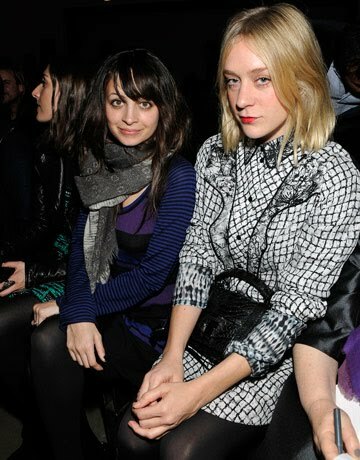 Nicole Richie and Chloe Sevigny front row at Proenza Schouler. Carlos Lopez, Nicole Richie and Vanessa Traina at Proenza Schouler. Mary Kate Olsen and Nicole Richie front row at Proenza Schouler. Rachel Bilson and Rihanna sit aside Nicole Richie and Joel Madden at the Zac Posen show in 2007. Nicole Richie all smiles front row at an Oscar De La Renta low. Nicole Richie sits next to Heidi Klum front row at a Michael Kors show. Nicole Richie and Alicia Keys front row at Zac Posen. Carlos Lopez, Nicole Richie and Mila Jovovich at a Max Azria show. Winona Ryder, Christina Ricci and Nicole Richie front row at DKNY. Nicole Richie and Joel Madden leaving Mercedes Benz fashion week. I'm looking forward to seeing Nicole Richie looking fabulous this year at NYFW!